Pratiksha Apurv is a well known contemporary Indian painter based in Pune. Born into the family of world renowned spiritual master OSHO, Pratiksha created her own niche in contemporary Indian art within a short span of time. Her paintings have been exhibited in several cities across the country, including Delhi, Mumbai, Bangalore, Chennai, Ahmadabad, Vadodara, Chandigarh and Goa. In 2016, Pratiksha won the National Award for her painting titled Cosmic Balance for the year 2015-16. The Award was conferred by Lalit Kala Akademi, under the Ministry of Culture, Government of India. 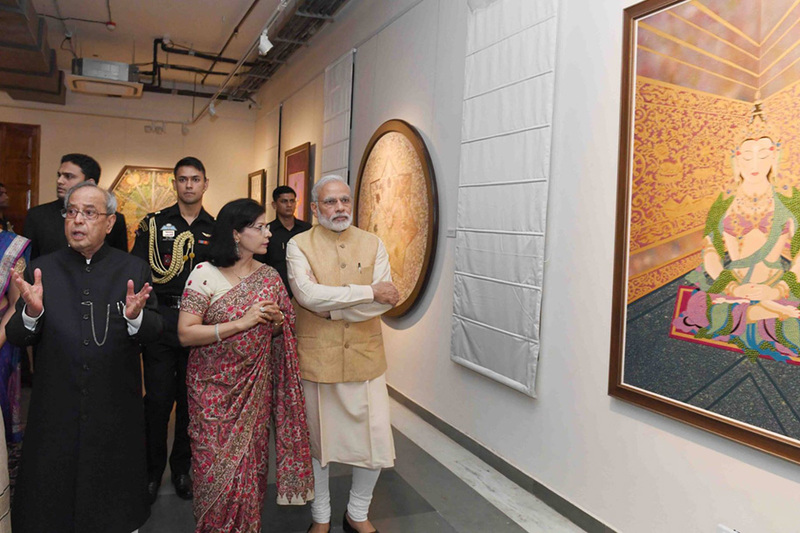 In a historically unprecedented occasion in the arena of Indian art, Pratiksha's Mystical Moments- a series of paintings was inaugurated at Rashtrapati Bhawan Museum by Prime Minister Shri Narendra Modi on 25th of July, 2016. The occasion was graced by President Shri Pranab Mukherjee; Vice Shri President Hamid Ansari, Chief Justice of India, Lok Sabha Speaker, Council of Ministers and other distinguished dignitaries. She is also author of “The Mystic and Her Colours” a coffee table book published by Times Group Books. Her works based on meditation popularly known as meditative art, witnessed a revival following the launch of her first painting series titled Spiritual Odyssey in 2007, which was inaugurated by former Prime Minister Shri Atal Bihari Vajapyee. During his formal address, he congratulated Pratiksha for her paintings with these words: "Pratiksha, I would like to bow to you. I was not aware of your talent and did not know the quantum of work that you have created. Your creations are thought provoking. Please continue your search (Sadhna)." Inaugurating her show at Ahmadabad in March 2010, the then Chief Minister of Gujarat, Shri Narendra Modi during his formal address spoke about Pratiksha saying- “when I met Pratiksha, Just out of curiosity, I asked her whether she has had any education or training in painting. Pratiksha told me, she never had any formal training. It was her inner journey which steered her into the world of creativity. I never got the privilege to meet OSHO. When he came to Ahmadabad, I was small child, but I distinctly remember that he was here. With Pratiksha’s art at least I can savour his vision. This experience cannot be described in words but I can only say that today I enjoyed his blessings.Pratiksha not only created these painting, but also put life in her canvas. She infused life in the paintings through her Sadhna. Her artworks are amalgamation of knowledge, creativity, faith and Sanskar, and I am sure people will learn and enjoy the message”.The same year, her painting titled Whirling was selected by the well known Sufi scholar and author, Sultan Shahin as the cover for his book titled-‘Introducing New Age Islam’. The book was released and widely circulated during the UN Human Rights Commission meeting in Geneva in 2010. The same year, a book titled- ‘Indian Artist- an Introduction’ released by LLC Inc, USA about prominent India painter’s have dedicated a chapter on Pratiksha and her paintings. Selections of a few paintings were also prominently featured in the renowned author Vikram Chopra’s magnum opus ‘Shakespeare: the Indian Icon,’ published by the Readers Paradise in 2011. This book was also separately released internationally also. In March 2012, about thirty four of her paintings from her collection were selected by ICCR, under the Ministry of External Affairs, Govt of India, for their magazine ‘Indian Horizon’- A special edition that centered on the message of Vedanta and Swami Vivekananda. This also included a special edit portraying her paintings. She was also a member of jury comprising of prominent personalities of the country for prestigious 'Swedish Innovations - Indian Interpretations' photo contest that was organised by Embassy of Sweden in August 2012 at New Delhi. Pratiksha is also on the jury of several government organisations. The jury comprises of eminent artists and top bureaucrats for procurements of artworks and installations for government institutions. In 2013, ten of Pratiksha’s paintings titled ‘Divine Art’ were selected and presented for the ‘Soul of Asia’ section of the 44th International Film Festival of India (IFFI). The festival was held from 20th to 30thNovember, in Goa. The painting exhibition was inaugurated jointly by Union Minister for Information and Broadcasting, Manish Tiwari and Hollywood star Susan Sarandon. The 11-day long festival also witnessed the screening of a film titled: ‘Master of the Masters’ which featured twenty two paintings of Pratiksha. While inaugurating the show Susan Sarandon said of her paintings: “In the long history of art there have been quite a few definitions of contemporary paintings and its purpose in our life. The most surprising are the ones that tell us the story of inner journey by opening up a huge cache of subjects, and supplementing the revelations on canvas with spiritual experiences in life. When I met Pratiksha at the International Film Festival of India in Goa in 2013, I was delighted to see the breathtaking candour of her personality and its reflection on her paintings”. Through her paintings Pratiksha has tried to visually depict the vision of Osho’s as she understood it. In India, knowledge has often manifested itself and transmitted hrough art, and the two have generally been an inseparable part of our cultural fabric, enriching us multi-dimensionally. Her paintings are infused with a distinct flavour that seems to draw the discerning viewer into a certain space of silence and experience. The paintings are themselves an outer expression, and reflect her personal inner meditative experience. Pratiksha has completed twelve solo exhibitions of paintings which have been showcased across the country for the art lovers. In the past twelve years, she has produced four important series on meditative art, namely- Spiritual Odyssey, Reflections, Divine Art and Mystical Moments- these have been instrumental in reviving the ancient Indian meditative art, also known as Objective art in the western world. Pratiksha’s efforts seem to present a comprehensive document of experiential spiritual painting. Moments of meditation and deep experience of silence can be felt through the body of her work on canvas, depicted through vibrant colours, designs, lines and strokes that reflect a unique relationship, between its creator and her canvas. According to her, it is important to be in harmony with both the inner and the outer world. Material and Spiritual worlds can be bridged through meditation, and this has always been the vision of Osho. To Pratiksha, her paintings are an attempt to express the inexpressible, and to offer a glimpse of ‘what is’ to a potential seeker, regardless of their religion, creed or path. Her paintings have been covered widely by the mainstream media in more than 400 articles by various newspapers and magazines, unleashing discussions upon meditative art. Apart from the print media, the broadcast media which include the National Broadcaster Doordarshan, Lok Sabha TV, All India Radio, and private satellite channels like Zee, Sahara, NDTV, Radio, Kannada TV and Gujarati channels, have covered more than twenty shows in different formats like-live shows, talk shows, and news items about her art. Prof. Shailendra Kushwaha, former Dean and art historian, and presently advisor of MS University, Vadodara, Gujarat, has been researching her paintings. He feels that her paintings could be considered as new wave within the modern contemporary Indian art. His research work will also be published separately in a book form. Born in Madhya Pradesh, Central India on 26th February, 1964, Pratiksha was initiated into Sannyas at her own request by Osho, her Uncle, when she was only eleven years of age, while living with her family in the Osho commune in Pune, Maharashtra. Amongst her childhood memories at the commune, she recalls an occasion when she was gifted a box of sketch pen and encouraged to draw by Osho. Although, she started painting in 2003, her first exhibition was formally inaugurated in 2007. Her mystic works on canvas, tells the story of a seeker’s life. There is something about her spirituality, unique to her painting, which puts Pratiksha in a different league from most contemporary painters. Her decision to bid adieu to a successful career in fashion designing, and to embark on an inner journey, to eventually present it on canvas is indeed a rare and unique achievement for a woman in today’s world. In the last 11 years since the launch of her Solo Exhibition 'Spiritual Odyssey' Pratiksha has worked on various aspects of Meditative Art. Some of her themes include: Seven Energy Centres, Seven Layers of Consciousness, Five Senses, Sixth Sense and Beyond Senses. 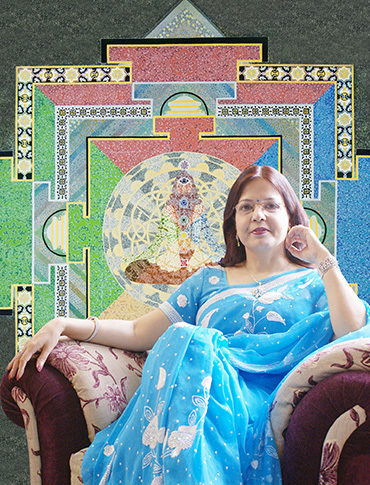 She has also done a series on Tantra, Yoga, Five Elements and Optical illusion. Although, volumes have been written on the subject of 'Life and Death', Pratiksha has tried to depict this important subject through Colours. Her paintings also reflect the messages of Gautam Buddha, Krishna, Meera, Kabir, Nanak, Sufis, Jesus, Islam, Zen and the Upanishads. Several of Pratiksha’s paintings are in Public and Private Collections in India and Abroad. ii) Over 400 articles about Pratiksha's paintings have appeared in different newspapers, magazines, and websites around the world. Pratiksha regularly writes articles for ‘The Speaking Tree’, a weekly edition of the Times of India Group. Her writings are about her paintings and her inner experiences. Pratiksha’s first book ‘The Mystic and Her Colours’ has been published by the Times Group Books. It was launched by world-renowned Film maker Vishal Bhardwaj and Singer Rekha Bhardwaj on 5th September 2018 in Mumbai.